Aim: This study aimed to understand variation of weight Z-score in preterm infants with Extrauterine Growth Restriction (EUGR). Methods: Inclusion criteria included: 1) gestational age<32 w; 2) more than four w of hospital stay; 3) survived when discharged. All enrolled preterm infants were divided into EUGR group and non-EUGR group according to whether the standard weight at discharge below the 10th percentile of body weight at corrected age. The differences and trends between the two groups were compared. The weight Z-score of preterm infants were calculated at each time point. Weight Z-scores of preterm infants diagnosed EUGR by the Receiver Operating Characteristic (ROC) curve. Results: 177 preterm infants were enrolled, in which EUGR was 104 cases and the incidence was 58.8%. 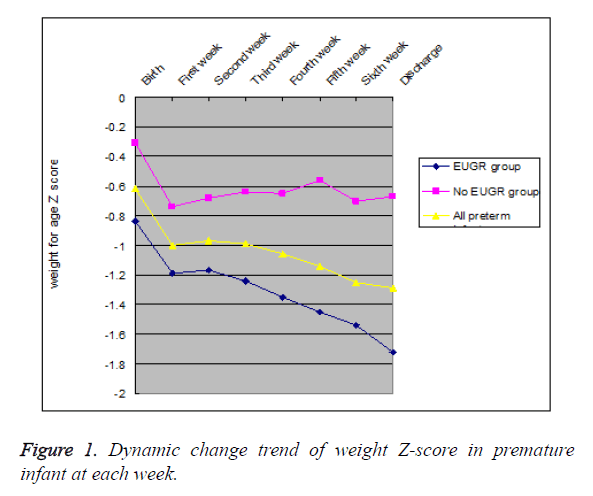 Weight Z-scores curves of EUGR group were under the curves of all preterm infants and the curves of non-EUGR group were above that. Both weight Z-scores of two groups were negative. The weight Zscores of EUGR group were lower than that of non-EUGR group at each timepoint (all P<0.05). Discharged Z-scores in all premature infants were positively correlated with birth weight(r=0.443, P<0.05). Discharged weight Z-scores in all premature infants were negatively correlated with starting enteral feeding time(r=-0.271), time of full enteral feeding(r=-0.332), time of parenteral nutrition up to 100 Kcal/Kg.d (r=-0.388), Cumulative doses of amino acids (r=-0.298), and cumulative doses of fat milk (r=-2.221) (all P<0.05). The AUC of weight Z-scores predicting EUGR was increased gradually along with prolonged hospitalization. There were statistically significant in weight Z-scores predicting EUGR (all P=0.000) and a high sensitivity and specificity at each timepoint. Conclusions: Dynamic monitoring weight Z-scores in the preterm infants can show its nutrition and growth trend, and might warn the risk of preterm infant suffering EUGR. Extrauterine growth restriction, Preterm infant, Weight z-score. Extrauterine Growth Restriction (EUGR) is a serious problem in preterm infants especially for neonates who are small, immature, and critically ill. EUGR is typically defined as a growth measurement (weight, length, or head circumference) that is ≤ 10th percentile of the expected intrauterine growth for the postmenstrual age at the time of discharge . The current trend is to avoid, wherever possible, EUGR through early, aggressive parenteral nutrition (with nutrients similar to those the foetus would receive through the placenta) and enteral feeding as early as possible . Many researchers recommend that the nutritional management of preterm infants, especially of extremely preterm infants, should support growth at a rate that approximates the rate of intrauterine growth [3,4]. Despite these measures to prevent EUGR has been implemented. However, EUGR continues to be prevalent, occurring in the majority of extremely preterm infants [5-7]. In order to obtain outcomes such as reduced incidence of EUGR, it is important to early predict EUGR. The aim of this study was try to early predict EUGR by weight Z-score. This study was approved by Ethics Committee of Huaian Maternity and Child Healthcare Hospital and parents of the neonates were informed about the nature of the study and written consent. The enrolled preterm infants were hospitalized in Neonatal Medical Center of Huaian Maternity and Child Healthcare Hospital from January 2011 to December 2013, who met the following conditions: (1) Gestational age<32 w. (2) more than 4 w of hospital stay and survived when discharge. (3) Admission age<24 h. (4) at discharge, preterm infants meet the discharge criteria (Temperature stable in the normal range, full enteralnutrition, no oxygen dependency and apnea). (5) With a complete medical records. The sample size was determined by the number of enrolled preterm infants admitted to our hospital in three years. This is a retrospective study. The enrolled preterm infants were divided into EUGR group and non-EUGR group according to whether the standard weight at discharge below the 10th percentile of body weight at corrected age. The weight of the preterm infants after birth was recorded weekly and the weight Z-score of preterm infants were calculated accordingly. The formula: Weight Z-score=(actual body weight-the average of the gestational weight)/standard deviation of the weight for gestational age. In addition, the clinical nutrition-related indicators such as birth weight recovery time, the maximum of weight loss, weight growth rate, Start enteral feeding time, time of parenteral nutrition up to 100 Kcal/Kg/d, time of full enteral feeding, time of first use amino acid, time of first use fat milk, cumulative doses of amino acids and cumulative doses of fat milk were also recorded. The data were expressed as means ± Standard Deviations (SD) and Bivariate correlation analysis were used by SSPS 18.0 software (SPSS Inc., Chicago, IL, USA). Differences between two groups at each time point were analysed with the Student’s t test. The Receiver Operating Characteristic (ROC) curve in diagnosing EUGR by weight Z-score was drawn. P value<0.05 was considered statistically significant. The 177 preterm infants were enrolled, and in which EUGR were 104 cases, and the incidence was 58.8%. In the EUGR group, male was 61 cases (58.7%), female was 43 cases (41.3%), gestational age was 28 to 31 ± 6 w, the average was (30.82 ± 1.15 w), discharge gestational age was 34 to 42 ± 3 w, the average was (36.97 ± 1.25) weeks, birth weight was 0.78~1.98 kg, the average was (1.41 ± 0.22 kg), discharge of body weight was 1.79~2.72 kg, the average was (2.17 ± 0.18 kg), weight Z-score at birth was -1.66 to 0.11, the mean (-0.84 ± 0.39), Discharged weight Z-score was -2.75~-0.45, the average was (-1.72 ± 0.38), hospitalization time was 28 to 105 d, the average was (40.14 ± 12.88 d), mechanical ventilation was 14 cases (13.5%), neonatal respiratory distress syndrome (RDS) was 44 cases (42.3%), patent ductus arteriosus (PDA) was 11 cases (10.6%), retinopathy was cases (6.7%), bronchopulmonary dysplasia was 10 patients (9.6%), necrotizing enterocolitis was 4 cases (3.8%), severe anemia was 18 cases (17.3%), and asphyxia was 32 cases (30.8%). Weight Z-scores curve of EUGR group was under the curve of all preterm infants, and the curve of non-EUGR group was above that. The weight Z-score of preterm infants in EUGR group and all preterm infants decreased gradually with prolonged hospitalization at each time point. However, the weight Z-score of preterm infants in non-EUGR group does not have significant differences at each timepoint except decreased at the first week. These can be seen in Figure 1. Figure 1. Dynamic change trend of weight Z-score in premature infant at each week. Both weight Z-scores of two groups were negative. The weight Z-scores were lower in EUGR group than in non-EUGR group at birth, 1st w after birth, 2nd w after birth, 3rd w after birth, 4th w after birth, 5th w after birth, 6th w after birth, and discharge (all P<0.05) . These can be seen in Table 1. Table 1. Comparison of weight Z-score between EUGR and non-EUGR group at each timepoint. Discharged weight Z-scores in all premature infants was positively correlated with birth weight(r=0.443, P<0.05). Discharged weight Z-scores in all premature infants were negative correlation with start enteral feeding time (r=-0.271), time of full enteral feeding (r=-0.332), time of parenteral nutrition up to 100 Kcal/Kg/d (r=-0.388), Cumulative doses of amino acids (r=-0.298), and cumulative doses of fat milk (r=-2.221) (all P<0.05). These can be seen in Table 2. Table 2. Correlation analysis between discharged weight z-scores and clinical nutrition-related indicators. The ROC area under the curve (AUC) was 0.829 (95% confidence interval (CI) 0.768~0.890, P=0.000) for Weight Z-scores at birth, 0.812 (95% CI 0.750~0.874, P=0.000) at 1 w after birth, 0.820 (95% CI 0.758~0.882, P=0.000) at 2 w after birth, 0.889 (95% CI 0.840~0.937, P=0.000) at 3 w after birth, 0.892 (95% CI 0.845~0.939, P=0.000) at 4 w after birth. The AUC of weight Z-scores predicting EUGR was increased gradually along with prolonged hospitalization. There were statistically significant in weight Z-scores predicting EUGR (all P=0.000) and a high sensitivity and specificity at each timepoint. These can be seen in Table 3 and Figure 2. Table 3. The AUC, diagnostic cut-offs, sensitivity and specificity of the weight Z-score predicting the EUGR. Figure 2. 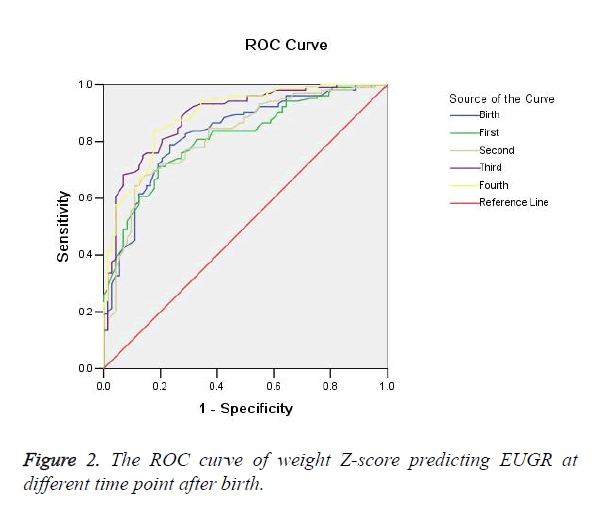 The ROC curve of weight Z-score predicting EUGR at different time point after birth. The EUGR may be due to multiple factors. The main risk factors of EUGR were the protein and energy deficits during the first several weeks of life, which prove difficult to reverse . Other factors independently associated with EUGR have included intrauterine growth restriction, male gender, need for assisted ventilation on the first day of life and the prolonged need for respiratory support, length of hospital stay, and the development of neonatal morbidities such as Bronchopulmonary Dysplasia (BPD), Necrotizing Enterocolitis (NEC), and late-onset sepsis [9,10]. Z-scores are superior to percentiles for infants whose size is outside of the normal range of a growth chart, that is, beyond the 3rd and 97th percentiles. Z-scores refer to the number of standard deviations greater (positive value) or smaller (negative value) than the median. For example, using percentiles, an infant would be described as weighing less than the 3rd percentile, whereas with z-scores, the infant could be described more precisely as having a weight z-score of -2.7 or -3.2. By examining serial z-scores it would be apparent whether the infant was maintaining growth at, or growing faster than or slower than, the intrauterine rate . The study reported that maternal hypertension, male gender, small for gestational age at birth (SGA), RDS, and the length of hospital stay were significantly associated with weight z-score at hospital discharge . In this study, Discharged weight Z-scores in all preterm infants were negatively correlated with starting enteral feeding time, time of full enteral feeding, time of parenteral nutrition up to 100 Kcal/Kg/d, Cumulative doses of amino acids, and cumulative doses of fat milk (all P<0.05). These results suggest that the nutritional status of preterm infants was relevant with discharged weight Z-scores. In this study, the weight Z-scores of all preterm infants were negative. Weight Z-scores curve of EUGR group was under the curve of all preterm infants, and the curve of non-EUGR group was above that. The weight Z-score of preterm infants in EUGR group and all preterm infants decreased gradually with prolonged hospitalization. The weight Z-score of non-EUGR preterm infants have not significantly differences at each timepoint. These results suggest that decline trend of weight Z-scores in all preterm infants was mainly due to EUGR preterm infants, and that indicating growth of EUGR preterm infants presented progressive downward trend. In the study, there were statistically significant in weight Z-scores predicting EUGR preterm infants and a high sensitivity and specificity at each timepoint. The results suggest that weight Z-scores might early to predict the occurrence of EUGR preterm infants. Dynamic monitoring weight Z-scores in the preterm infants can show its nutrition and growth trend, and might warn the risk of preterm infant suffering EUGR. However, further studies that enrol larger number of cases are needed to confirm our findings. This work was funded by grants from Science and Technology Program of Huaian City (Project no: HAS2015004). Clark RH, Thomas P, Peabody J. Extrauterine growth restriction remains a serious promblem in prematurely born neonates. Pediatr 2003; 111: 986-990. Espinosa Fernandez MG, Sanchez-Tamayo T, Moreno Algarra MC. New clinical practice guideline on enteral feeding in very low birth weight infants; second part. Nutr Hosp 2014; 30: 329-337. American Academy of Pediatrics. Committee on Nutrition. Nutritional needs of low-birth-weight infants. Pediatrics 1977; 60: 519-530. Agostoni C, Buonocore G, Carnielli VP. Enteral nutrient supply for preterm infants: commentary from the European Society of Paediatric Gastroenterology Hepatology and Nutrition Committee on Nutrition. J Pediatr Gastroenterol Nutr 2010; 50: 85-91. Stoll BJ, Hansen NI, Bell EF. Neonatal outcomes of extremely preterm infants from the NICHD Neonatal Research Network. Pediatrics 2010; 126: 443-456. Cole TJ, Statnikov Y, Santhakumaran S. Birth weight and longitudinal growth ininfants born below 32 weeks gestation: a UK population study. Arch Dis Child Fetal Neonatal Ed 2014; 99: 34-40. Lima PA, Carvalho Md, Costa AC. variables associated with extra uterine growth restriction in very low birth weight infants. J Pediatr (Rio J) 2014; 90: 22-27. Embleton NE, Pang N, Cooke RJ. Postnatal malnutrition and growth retardation: an inevitable consequence of current recommendations in preterm infants? Pediatrics 2001; 107: 270-273. Ehrenkranz RA, Younes N, Lemons JA. Longitudinal growth of hospitalized very lowbirth weight infants. Pediatrics 1999; 104: 280-289. Shan HM, Cai W, Cao Y. Extrauterine growth retardation in premature infants in Shanghai: a multicenter retrospective review. Eur J Pediatr 2009; 168: 1055-1059. Fenton TR, Sauve RS. Using the LMS method to calculate z-scores for the Fenton preterm infant growth chart. Eur J Clin Nutr 2007; 61: 1380-1385. Ehrenkranz RA. Extrauterine growth restriction: is it preventable? J Pediatr (Rio J) 2014; 90: 1-3.